Could you ever imagine Bowser and Mario working together? What about Donkey Kong and Princess Peach? Could hungry, frog tongue Yoshi ever be friends with the Koopa Troopa that in earlier games was his chewing toy? In this game he can! 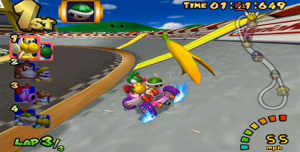 This fun-packed black sheep of the Mario Kart franchise allowed for two player cooperation. You could drive the kart with your character in the front steering, while your buddy stands in the back and throws items from the Mushroom Kingdom at rival teams, punches nearby competitors, or gives you a boost with a Mushroom. I wish the cooperative feature had become a tradition in post Double Dash Mario Kart games. Mario Kart Wii goes back to the lonely one-player-per-kart races. If Nintendo felt that they should be loyal to the legacy of the Mario Kart games, in the sense of keeping the Super Nintendo version’s feel as an individualistic endeavor to be number one in a race with able competitors, then they should have at least made the cooperative feature an option. This would have given an option to those of us who grew fond of choosing two characters or cooperating with a buddy. Why Nintendo? Why did you abandon your great and innovative experiment in kart gameplay? Why did you start a revolution and contain it in only one game? Who cast the Iron Curtain around Double Dash? Since Nintendo can’t immediately address my questions I will answer them myself by resorting to the Internet’s most respectable example of deductive reasoning- the conspiracy theory! Nintendo, a private and capitalist enterprise, is trying to send a message to the general public, namely, that communism must be contained. Hear me out and you will see how this is related to Mario Kart with great clarity. With its headquarters in capitalist Japan, Nintendo is afraid of communist China, and does all it can to portray communism as a failed ideology. To do this, they give us a legacy of Mario Kart games, most of which only permit one driver per kart, extolling individualism, a capitalist trait, and one which features cooperation, a communist trait. As the Soviet Union rose and fell in the 20th Century, cooperation was only allowed in one Mario Kart game. 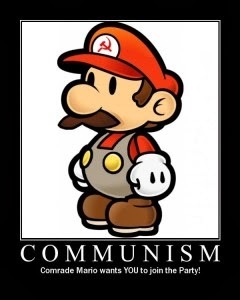 With that, Nintendo subtly tells us that communism is a failed system that should not be reconsidered. Mario’s red clothing has made Nintendo suspicious of his political affiliations, and do not want him recruiting the aid of other potential revolutionaries, and so they practice containment by designing their karts to fit only one person. Nice try Nintendo! I say it is time to tear down the wall and allow the revolution to spill into new Mario Kart titles, if not as the main feature, at least as an option. And while we are at it, the 3DS would be a great platform for a Double Dash like game. Just imagine, you could drive your kart with one DS, having a clear view of the road, while you partner, with his own DS, could view the rear and sides to decide when it is prudent to use an item to throw at rivals or to give you a power-up. The DS has the ability to monitor its motion, so the helping player would be able to physically turn 360 degrees to where he needs to see. That would definitely put the player in the game. 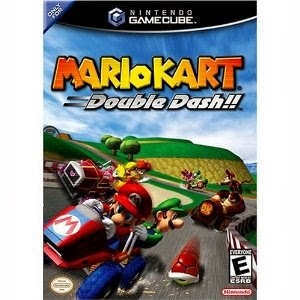 I have to admit, when I first laid my eyes on Mario Kart Double Dash’ box at the game store, I was not impressed with the dramatic shift from the way Mario Karts usually were. But now I’ve gotten used to the cooperative feature to the point that I feel that other titles in the franchise should at least have that option. Double Dash even allowed for every character type to have special items, for example, Mario and Luigi could throw fireballs, Wario and Waluigi could throw the Bob-om, and Peach and Daisy could use a protective heart. Other Mario Kart games don’t have such a feature that adds individuality to their characters, and I think that they should. Either way, that is just my opinion. I still like any Mario Kart game and they never get old. What do you guys think? Comments are welcome and more likely than not I will reply. Carlos can be emailed at carlos@latinogamer.com You can read more from Carlos at hanabuk.com, or follow him on Twitter and Facebook as well as follow his YouTube channel, lubicuslatinae. 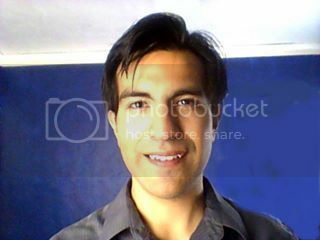 About the Author Carlos is the archeologist of Latino Gamer, looking at the oldies but goodies and making sure that their memory remains. A Graduate student at CSULA, Carlos has a BA in English and lives in Maywood (the little city that thinks it's big). He plays guitar, writes for fun, and overall loves to look at the bigger picture of things. Carlos es el arqueólogo de Latino Gamer. Se enfoca en los videojuegos de los tiempos viejos pero divertidos para asegurar que la memoria de los clásicos permanezca. Es estudiante de posgrado en CSULA, y tiene una licenciatura en Inglés. Vive en Maywood (la pequeña ciudad que se cree que es grande). Toca la guitarra, escribe para la diversión, y en general le encanta contemplar la vida.